Peter Jackson: Alright Cut! That’s wrap; ship it off to the theaters! I wonder if anyone watched this movie before it was released. 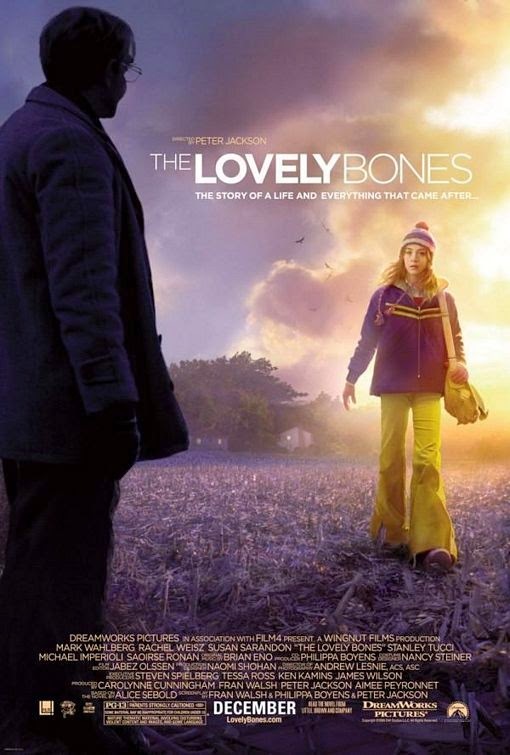 The biggest problem with The Lovely Bones is the tonal shifts and seemingly random editing. One second we are in a scene in Heaven/Purgatory, then we have a wacky montage with Grandma, then a creepy moment with Stanley Tucci, then Mark Walberg is sad, now back to Heaven for more adventures! The film (supposedly) follows Susie Salomon (Saoirse Ronan) in the events leading up to and following her death. Before she dies we learn about the things she loves and share in some “coming-of-age” vignettes. After she is murdered, we watch her families tortured response, her murderer’s worry of being caught, and her adjustment to the afterlife. In random order. Individual scenes that focus on one storyline can be really powerful and well constructed entities within the film. Both the beginning and the end of the film, for example are the strongest parts of the picture because the film jumps around less. No doubt Peter Jackson wanted to experiment with non-traditional editing, but man, this movie is all over the place. For example, one of the most jarring aspects of the film was during scenes when Susie would look at living people from Heaven/Purgatory (the difference between Heaven and Purgatory is not really explored... from what I gather Purgatory is by the lighthouse and Heaven is under that tree over there...). The film would use standard shot-reverse-shot between the real world and Heaven. The two characters were supposed to be in the same scene but in two different planes of existence with different visuals. So you might jump back and forth from a gazebo to a living room several times during a sequence if Susie was watching the sequence unfold. Thankfully Jackson will give us clues that Susie is watching “real life” (through an icicle or other prop – all of which try to be part of a puzzle that we didn’t know existed until the film yells “HEY AUDIENCE ALL THESE PROPS ARE PART OF A PUZZLE”). I’m not sure who I’d recommend this movie to... There is some fun and solid work from highly talented players, but unfortunately, the overall progress of the film is extremely jarring and difficult viewing experience. I suppose if you want to see the “latest Peter Jackson film,” the themes interest you, or maybe because you want to see the giant mess I’ve just described, you might find some enjoyment here. If you don’t think you would like it, you probably won’t.